The 3-day event will feature an array of activities including celebrity autographs with meet & greets, photo ops, Q&A’s led by special guests, live performances, a film festival, and their popular tattoo festival. 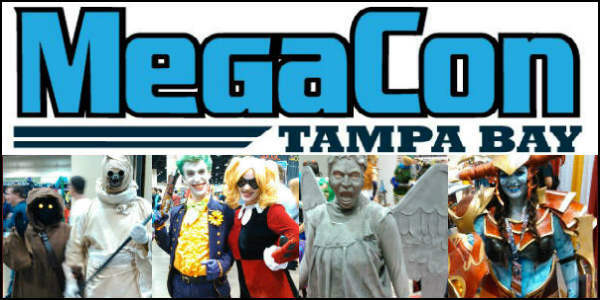 MEGACON™, the Southeast’s largest fan convention, returns to the Tampa Convention Center for another star-studded event from Friday, September 21 through Sunday, September 23, 2018. Spooky Empire has announced it will mark the 25th anniversary of the nostalgic film Hocus Pocus with guest appearance by Kathy Najimy, also known as Mary Sanderson from the film. Najimy is known for numerous beloved roles in films and TV series such as Sister Act, Hope Floats, Bride of Chucky, The Wedding Planner, The Guilt Trip, The Big C, Descendants, Veep, and more. Spooky Empire has announced an X-Files reunion as actor Gillian Anderson will join actor David Duchovny at its upcoming October event. This year’s convention will also celebrate its sweet sixteen on October 26 – 28, 2018 at its new host hotel, Caribe Royale Orlando Resort. Spooky Empire, the company that hosts one of the most coveted and recognizable horror/thriller conventions in the nation, announces its first guest for it’s October 2018 event: actor David Duchovny. Formerly known as LeakyCon, this fan convention is one of the largest and most recognized conventions for fans of fantasy films, television shows and young adult books. At the end of this year’s convention last weekend, LeakyCon as it currently is announced it will be rebranding as GeekyCon for its 2015, which will be returning to Orlando. The 2015 show will return to the Orange County Convention Center July 30 – Aug 2, and will continue to bring in guests from multi-fandoms, including actors, performers, and authors. The 2014 convention, which was attended by close to 5,000 people, featured a special private event at the Wizarding World of Harry Potter at Universal Studios Orlando. This doesn’t mean LeakyCon is ending. Mischief Management will return LeakyCon to its roots as a smaller, Harry Potter-only event held in different locations around the world. LeakyCon 2015 is being planned for the second half of the year with dates and location to be announced in the coming months. Registration for GeekyCon 2015 in Orlando opens August 9, 2014. For more information, visit geekycon.com.